OK. I forgot to show you something that I did last summer. And I’m really surprised I didn’t show you this earlier, because it was one of those decorating things that my husband told me I couldn’t do…. but I bugged him and bugged him until finally decided that this was not the hill he wanted to die on. I liked the shape and size for the most part, but hated the clear glass where you could see all our crap. Things started going my way when HH suggested we paint an accent wall in our living room. (Which was his fabulous idea, by the way.) We picked out paint together. I’m not sure how I did it, but I convinced him to let me paint the cabinet the very lightest green on the paint chip. This looks almost white, but it is a very, very, very light green. I love how it looks against the darker green wall. I also love that the two dark wood tables on either side of it look coordinated and polished. Before it was like Early American Garage Sale with all that competing wood. I primed the whole thing, painted it, then used Rustoleum’s glass frosting spray on the two glass panels. Rustoleum’s Hammered Metal paint turned the wooden knobs into metal ones. The winner, the winner, the winner!!! Please check the bottom of the blog to see where I’ve linked this project. This post is sponsored by Bathroom Mirrors Direct (BMD). Embellish your walls! Buy mirrors at BMD and inspire your creativity. I have to show this to Keith. Now I know what you did last summer (makes me think of that movie). This looks GREAT! I love what you did to the glass too. You were SO right! Man, this looks GREAT! I am sure it was a lot of work, but boy was it worth it! Seriously this is gorgeous!!! It lOoks like an expensive piece of furniture now. You definitely won!!! LOL…that looks amazing!!! It doesn’t even look like the same stand! I just won a small victory last night,too! I’m about to paint our sink cabinet in our half-bath!! But I am going black! 🙂 Oh….if they could just see our vision! That looks incredible!! So glad you won this battle because it looks amazing especially with the frosted glass. Way to go! it looks awesome, i love it! so, i want to paint my kitchen table white (which is currently a similar color to what yours was before the re-do) why didn’t you have to sand it first? this is the main reason I’ve been putting off doing it, because sanding the chairs would be torture. That does look so much better! So crisp and inviting. I think frosting the glass was the best move, it makes it so much less cluttered. OMG – everything looks great. I really love the details – frosted glass and the knobs!! I’ve got to get some of that metal paint and have at some of my knobs. It does look fab, though. The hammered metal paint is AWESOME. I love it. I used it last year on a bunch of stuff too! Okay totally bowing down to your awesomeness! And not only did you get to make it look awesome but you got to say I told you so! Priceless! Wow that was such a big piece of furniture to tackle. How long did that take you? And did you spray paint it? It looks white, but it’s green…I love that because it still brightens up the room. Tell HH I said thanks for finally giving in. It’s beautiful. It looks great! Doesn’t in feel good to win and to be told (in so many words) that your idea was right!! It turned out beautiful! Great job, Vivienne! It looks so amazing–so worth it! Congrats–lol! That is impressive! Love the new look. I was brought up thinking that I should never paint wood, but I am beginning to change my mind about that. Congrats on being right and on your beautiful redo! That is such an amazing transformation!!! It doesn’t even look like the same piece of furniture!! Wow!!! Gorgeousness!!! I love it and the fact that you got your way and were right makes it even better! Stunning difference! It is beautiful. Guess you showed him who the Number One Finest Kind Decorator is. Now tell me about the top of the wall by the seiling? The strip of differentness up there? What is it and how did you do that? Wow Vivienne! It looks absolutely stunning! Isn’t it amazing what a coat paint can do?! Great job! 🙂 Thank you so much for linking up! Hope you have a fantastic weekend! My jaw is on the floor! It is amazing!!! It looks gorgeous. Great job!! Looks great. I love those little victories! Thank goodness you won this victory ‘cuase it turned out fantastic! Wow what a transformation! It looks so much better!! Good choice you guys! The accent color and the furniture color look great! I have almost this exact cabinet sitting in my basement because it’s so old fashioned looking and doesn’t go with anything else. You are my savior, Miss Vivienne! I said that in some sort of southern accent because, somehow, I thought it sounded funny like that. love how the knobs now look like metal. Oh my gosh – stunning! It is amazing what a little paint can do. I LOVE it!! Looks awesome! So question – M is getting a daybed that is a yucky brown wood and I want it white – what do I need to use to paint it white? And make it last….. This looks so fantastic! “You were right” are my three favorite words, too, so I can only imagine how validating that is! 🙂 Thanks so much for sharing! Wow, this is inspiring me to do my own. It looks fantastic! That is simply amazing and a lot of hard work! What is the lighter paint that you used? I am thinking of painting a pie safe because it is that honey color now and pretty ugly. You were absolutely right on this one. LOVE this cabinet!! Is your husband by any chance related to mine? Just wondering…. Thanks so much for linking up to Saturday Social this week! I hope to see you next week as well!! OMG, this looks amazing! At first I didn’t think it was the same piece. LOVE IT! I love the color you used! They look so clean and new! Congratulations. It pays to be persistent. The cabinets look really good. Haha this is fabulous…almost as fabulous as those words!! LOVE, LOVE, LOVE!!!! Glad you went with your gut and did it! Way to go! It is music to our ears when the hubby says, “You were right!” Thanks for sharing! The center cabinet reminds me of the old time ice chests. BEAUTIFUL! Love that it’s not white! Thank you for linking to Wicked Awesome Wednesday! Beautiful! Love the hardware you chose too! Wanted to say “hi” as this is my first visit to your blog … saw your post on Clean & Scentsible. You have a great eye for what pieces can become and the “after” is wonderful. A woman must have invented paint because it seems that men are so resistant to the idea of painting large wood furniture! Glad you prevailed. 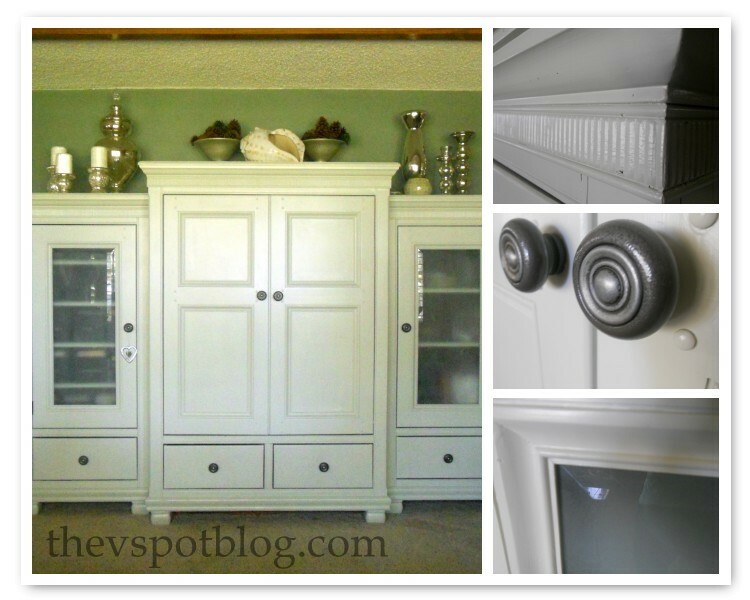 Great idea spraying the wood knobs because new hardware can be expensive and yours look great! Ah, being right feels so good! And your paint job is AMAZING! It looks amazing!! Such a great idea for the knobs and I love the frosted doors too. Thanks so much for linking up to The Creative Spark. I’ll be featuring this on my facebook page later today. Goodness, that is amazing! Wonderful job! Looks fabulous, when will the men start listening to us gals!!? It’s so good to know there’s hope for a new look! No matter how many times I see transformations done with simple painting….the shock factor never wears off! It’s looks so gorgeous! Hopefully this will help convince HH to give you free rein painting what you please! If they all turn out this wonderful you can’t go wrong! Hi! Found you from Home Stories A2Z link up party. I LOVE this transformation. Way to go! Isn’t it fun when you win? Oh that is such a man thing to not want to paint wood, even if the wood doesn’t go with anything else. Why???? That is one amazing Redoux. I seriously would have had to look hard to figure out the before and after even went together. I bet you are soooooo happy you finally got your way. And, the bonus that he tells you how good it looks! I love this. You did such a great job it doesn’t even look like the same piece! And it looks great with the wall color too. Beautiful! You were right! I love this and I featured it on my blog tonight. What a bear of a project, so worth it though it’s sooooo much better!! Love the frosted glass!!!! Love it!! Looks so fresh and pretty. Totally a hill worth fighting for! Thanks for sharing your post!!!! Wow, what a transformation! It’s gorgeous!! Gotta agree with everyone who saw this before I did. Looks great! My hubs has a thing against painting wood, but after 35 years of having it his way, he’s caving in to let me have some things my way. Now that we’re both disabled and can’t just do it like when we were healthier, it’ll take years to get it done, but I won!!! Isn’t it a great feeling????? WOW!!! LOVE! it turned out so great! Please tell me how you get so many people to comment??? I’d love to know the trick as I know FULL well how great it is to receive comments & how encouraging it is to a blogger. amazing redo. I love the color you chose on the wall and on the cabinet pieces. Beautiful job! Love the new look. I also think it’s great that you used a perfectly good piece(s) of furniture and updated it to make it look new. I love how it looks in the room. Just saw your linkup on beneathmyheart! So so so awesome! Love those major redo’s! Love this! I know I already told you so. I featured it today at my Delightfully Inspiring Thursday Party. Stop by and check out the great inspiration link ups. “Gosh, that looks so much better!” ~ No really! That looks amazing!! Wayyyy much better! I can imagine the smile on your face when he said that it looks better 😉 Congratulations for the new look, really nice! I know you will make it! Good luck to the next!